Is pharma shedding employees to protect and grow the bottom line? Judging from the headlines, you might think so. But actually, instead of getting “leaner and meaner,” most big drug companies are getting fatter and softer — and a result, pharma’s human capital efficiency has been mostly stagnant. From 2011 to 2015, employee numbers actually increased at six of the 10 most R&D-intensive global pharma companies, and fell by less than 10 percent at three others. Only Merck cut a significant portion of its workforce, trimming 21 percent of staff over that period. Whatever job losses you’ve read about appear to have been offset by transient growth due to M&A or unreported hiring in other areas, neither of which tends to grab headlines. But perhaps pharma companies are finding other ways to boost productivity? After all, many have boasted of site closures and restructurings as ways to bolster profits, particularly after major acquisitions. And outsourcing has continued to grow in personnel-intensive areas like clinical development. So, even though headcount is staying stable, is each employee generating more returns for the company? Alas, that doesn’t seem to be the case. 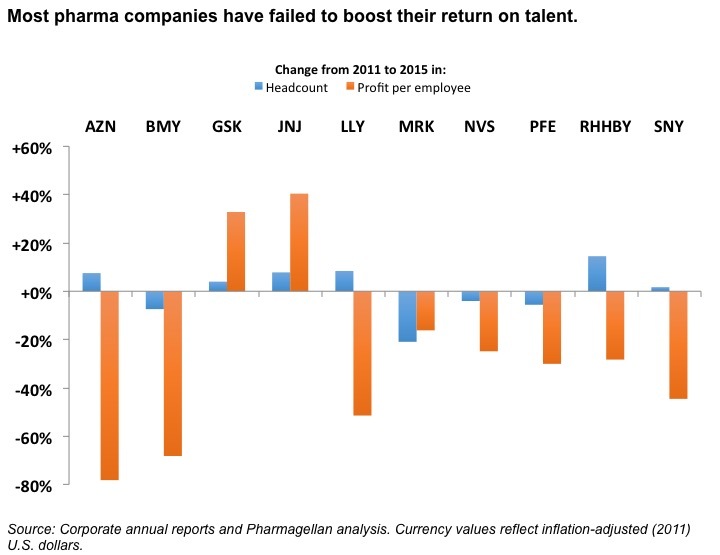 Using inflation-adjusted profit per employee as a simple measure of labor efficiency, we found net returns per head fell in eight of the 10 drug companies we analyzed – and by more than 50 percent in three of them. So at most big pharma firms, the workforce isn’t becoming more productive, at least by corporate financial metrics. To be fair, the denominator of profit per employee in pharma includes R&D staff, whose efforts may not positively impact the bottom line for many years, if ever. Ideally, we would calculate per-capita productivity based just on non-research workers, and measure how the folks charged with running operations and generating profits quarter to quarter are performing – but sadly, virtually no pharma companies provide sufficiently detailed headcount breakdowns to perform this analysis. And in fact, the challenge of accurately measuring labor productivity in pharma highlights a key opportunity for drug makers and their investors. If firms want to argue that much-ballyhooed restructurings, IT investments, outsourcing plans, and the like are leading them to become “leaner and meaner,” they should start reporting profit per commercial employee or some other reliable metric that can be tracked over time. Until then, investors should be skeptical of claims that layoffs and other “strategic initiatives” are boosting pharma’s net return on talent.